Go to Cybozu at https://<your domain name>.cybozu.com. Enter your login name and password, and then select Login. 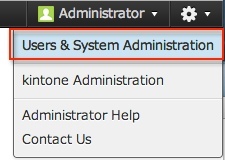 Under the gear icon in the upper right, select Users & System Administration, as shown below. 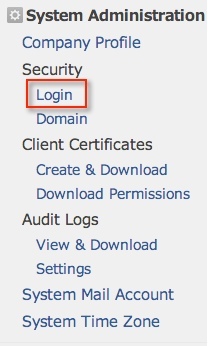 In the menu that appears on the left, select Login in the Security section, as shown below. 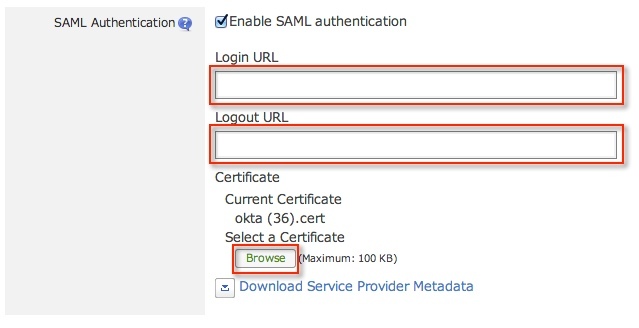 In the SAML Authentication section that displays in the right pane, check Enable SAML authentication, as shown below. The sections expands to show the following items. Copy the following information into the Login URL field. Sign into the Okta Admin dashboard to generate this value. Copy the following information into the Logout URL field. Upload it to the certificate field by clicking the Browse button. Verify the setup by completing the following two tasks. Access Kintone Cybozu from Okta. This verifies the identity provider authentication. Successfully sign out by selecting the Logout option on the gear icon in Kintone.